Canadian Forms & Precedents - Wills and Estates offers a unique blend of documents and supplementary commentary, ensuring that counsel understands what has to be done and what options are available at every stage in a procedure. Offering state-of-the-art precedents drafted by Canada's leading practitioners, Canadian Forms & Precedents is a comprehensive multi-volume set that provides the highest standard of legal forms and precedents in Canada. Covering all major subject areas, Canadian Forms & Precedents saves time and costs, and is the most comprehensive and authoritative library of drafting documents. Features over 180 up-to-date precedents on Wills, including particular will clauses and 19 complete wills covering virtually all likely scenarios, along with checklists, drafting tips and commentary which provides the legal context. 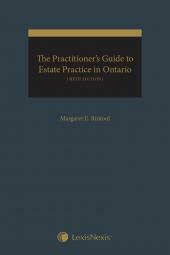 Also includes over 120 of the latest probate and estate litigation forms and up-to-date precedents, checklists and drafting tips and authoritative advice written by Margaret Rintoul, a prominent national figure in the wills and estates area and the author of Ontario Estate Administration and The Practitioner's Guide to Estate Practice. A key to the success of any law practice is having a wealth of sample forms and precedents to refer to quickly for any case which may arise. Canadian Forms & Precedents Wills and Estates is designed to meet the demands of busy practitioners by providing expertly crafted precedents that can be relied upon with confidence. Offering an easy-to-use format, this volume provides expert commentary that guides you through the basics of the law and practice in each area. The commentary is replete with expert drafting advice and tips, and is supplemented with meticulous checklists to help practitioners avoid legal pitfalls. This is followed by a comprehensive set of sample forms and precedents providing an extensive and unrivaled collection. Fully Revised and Updated in an Easier to Use Format! Margaret E. Rintoul has practised in the area of estate planning and administration, including contested estate and guardianship matters, for over 30 years, and is currently a partner with the law firm of Blaney McMurtry LLP in Toronto. She is currently rated by Lexpert as a leading practitioner in the area of estate law, and a member of the Law Society of Upper Canada, STEP (Society of Trust and Estate Practitioners), as well as the Ontario Bar Association and the Canadian Bar Association where she has served as the Chair of both the Ontario and National Wills, Trusts and Estates Sections. 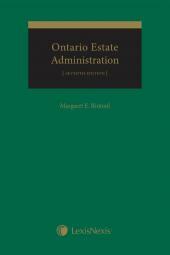 She is the author of The Practitioner's Guide to Estate Practice in Ontario, Canadian Forms and Precedents: Wills and Canadian Forms and Precedents: Estate Administration and Litigation. 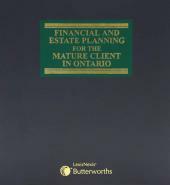 She is also a contributor to Financial and Estate Planning for the Mature Client in Ontario.